A lot of hybrid effect devices are cavorting on the market. So far, these have been combinations of acceptable single effects, which made a satisfactory mixture. Now, these effects impress like never before, as their fine tuning is better than ever – and especially the integrated lasers are really convincing. You have the choice between a KLS, a hybrid flower effect and an LED bar. If you know the KLS from Eurolite, you can guess that there’s more hidden in a KLS with integrated laser – this representative of the family offers a nearly complete club lighting on one bar: Two derby effects, four strobes and two slim spots share the bar with the laser. The KLS comes pre-assembled in a transport bag. Almost as well equipped is the FE-1500 Hybrid Laser Flower. The classic flower effect has been fitted with 8 strobe LEDs and a laser and now appears as a colorful bouquet of lights. 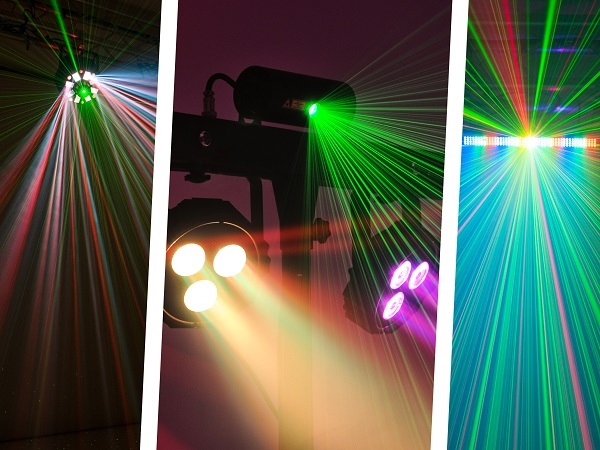 The third effect is the LED Laser Bar, offering 190 LEDs. Located in the center of the color changing bar is a laser with the colors red and green.